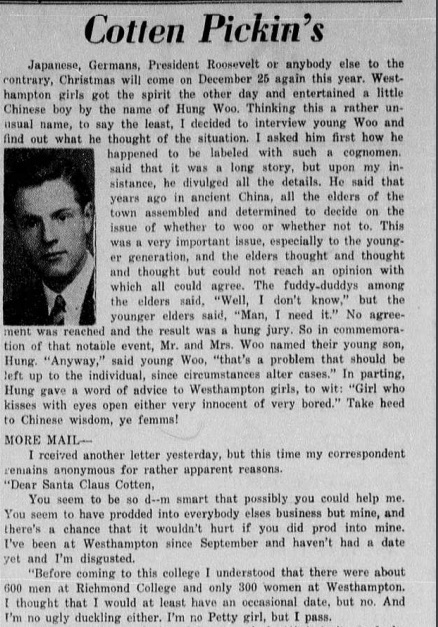 This article comments on the recent act by Westhampton college to adopt a Chinese child (a venture that is discussed in the Collegian on Nov. 28, 1941 entitled "Co-ords to Help War Orphans). 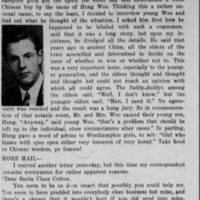 Cotten says that the adoption was done in the spirit of Christmas, and that they entertained a child named Hung Woo. Cotten then claims to have interviewed the visitor and asked him about the origin of his name. He tells a story of how in Ancient China, a jury of elders was hung when they could not decide whether or not they should woo. Thus, the child was named in honor of that event. He then says that at the end of the interview, Woo made a comment about kissing with your eyes open, and he quotes it with no pronouns, supposedly as a reference to how Woo speaks. This narrative is followed by a letter in which a Westhampton girl implores Cotten to encourage more Richmond College boys to ask girls on dates. Cotten, Bob, “Column "Cotten Pickin's",” Race & Racism at the University of Richmond, accessed April 18, 2019, https://memory.richmond.edu/items/show/468.